Click the button below to add the Superior Frosted Donut II - Masterpiece Pre wound bobbins 35 NEW colours to your wish list. Frosted Donut II (new 35 colors in a lavender BobbinSaver). 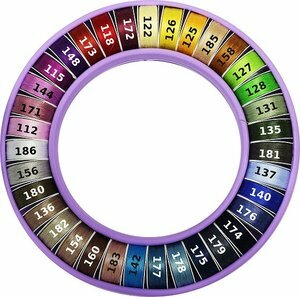 35 colors from our Frostings, L style prewound bobbins with our MasterPiece Thread. Tucked into a BobbinSaver for safekeeping and instant access to all colors. MasterPiece is #50 100% extra-long staple Egyptian-grown cotton. Colors in the Frosted Donut II (in order): 112, 171, 144, 115, 148, 173, 118, 172, 122, 126, 125, 185, 158, 127, 128, 131, 135, 181, 137, 140, 176, 174, 179, 175, 178, 177, 142, 183, 160, 154, 182, 136, 180, 156, 186. I haven't used the threads yet as I am taking them on my cruise where I will be using them. Beautiful array of colours. Great for hand applique. So happy to have this donut to take with me and use. Can not go psst this item at such a great price.